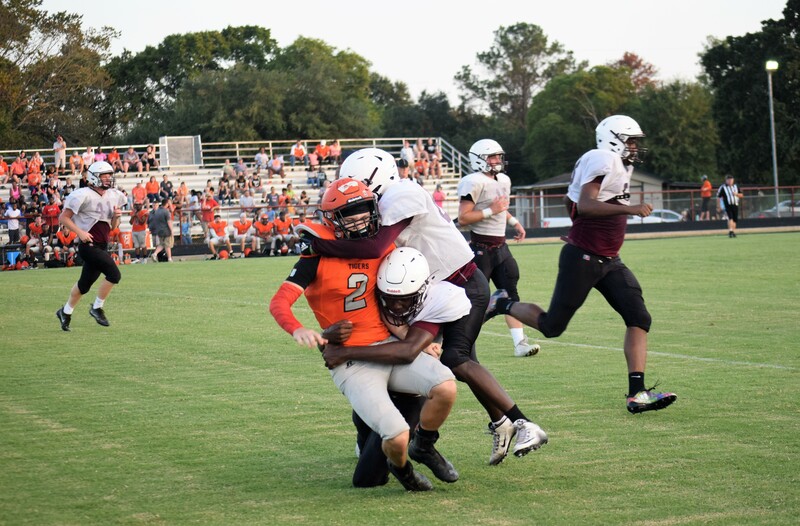 LOVELADY – The Lovelady Lions football team is growing accustomed to going deep in the playoffs and the 2018 season should be no different. The Lions finished the 2017 season with a record of 7-5 and a berth in the area finals, where they lost a back-and-forth game to the Rivercrest Rebels by a score of 22-20. A year older with a year of experience under their belts, the Lions return 16 letterman with six offensive and seven defensive starters for the 2018 season. “We’re going to be running the same offense as last year. We’ll be in a spread but in the scrimmages we huddled every time. Typically we wouldn’t huddle,” AD/Head Coach Jon Lowery said. The Lions, unfortunately, face a lack of depth, according to Lowery. “I think we only kept 21 or 22 kids out there with us for the varsity part of the scrimmage (against Trinity.) Depth is a huge issue for us right now. We ran a little bit of a slower pace in the scrimmage than we’ll run when the season gets here,” he said. As far as team strengths, the coach said he felt the Lions brought back a lot of experience at the skill positions. “Team quickness is another big advantage for us. We’re certainly not that big and not as big as we were on the line last year,” Lowery added. Due to the lack of depth, one area the Lions need to improve on, according to Lowery, is conditioning. “We are going to have to get in top condition in a hurry. For us to be successful, as always, we have to avoid injuries. If we could play every game with the kids we have access to – today – we would be fine. Football is a collision sport. Inevitably, some kids are going to get banged up. Even if they don’t get injured, sometimes you have to put them on the side lines. Staying healthy will be a huge key to our success this year,” the coach said. The Lions are in District 12-2A DII along with: the Burkeville Mustangs; the Colmesneil Bulldogs; the Evadale Rebels; the Grapeland Sandies; the Sabine Pass Sharks; and the West Hardin Oilers. Lovelady opens the season with a road game against their long-time rival – the Groveton Indians. The Lions follow that up by hosting the Tenaha Tigers – last year’s state runner-up. The coach was asked if he had any one date in particular circled and he replied it is Oct. 19, when Grapeland travels to Lovelady. “We have a lot of water under the bridge to get through before we get there, but Oct. 19. The weather should be cooled off and I hope all the Grapeland guys are healthy and all our guys are healthy. It should be quite a show on Oct. 19,” Lowery said. For the season to be successful, the Lions need to “… stay healthy. I don’t see a scenario where the Lovelady Lions are not a playoff representative from our district. Our goal – always – is to make the playoffs and hopefully go as far as we can. I wouldn’t be surprised to see the Lovelady Lions or Grapeland Sandies competing with the Mart (Panthers) for the Regional Championship,” he said. Players to watch include: Jay Thomas Robinson; Michael Price; Tim Johnson; Greyson Bachynsky; Deontrae Hawkins; Logan Lowery; Seth Murray; Logan LeBlanc; DeUndre Simon; Carter Murray; Tre’Von Hawkins; Colter Hardcastle; Tre Hawkins; T’Amian Platt; and Chris McKnight.